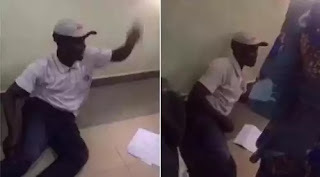 There was a mild drama in the Gwagwalada area of the federal capital, Abuja on Friday when a fully grown man laid on the floor of a popular bank over the bankers’ refusal to give him his N5000 stuck with them. It was gathered that the man who was aggrieved was ready to take his money home and did not seem to care about the people standing by and watching as he kept talking to the people who had the patience to listen, airing his grouses with the bank. The man said he had not eaten since the time he set foot in the bank. He explained to people watching that he hustled hard to keep the money in his account. After that, the bank officials said the account was blocked for some unknown reason. This made the man lay on the floor and refused to get up. He kept asking why the bank did not close his account before he deposited money into it. It is however not know how the man and the bank were finally able to resolve the matter.